All the music and lyrics for “VII / Född Förlorare”, which is due for release on the 25th May, were written by SHINING’s founder and front man Niklas Kvarforth, and the album was recorded over what the band describes as “three long years” inside the Slaughterhouse studios in Sweden, with Rickard Bengtsson once again producing. Kvarforth himself defines the finished result as “THE” SHINING album. “It is”, he commented, “the natural successor to our fifth album “V/Halmstad”, rather than to our last release “VI/Klagopsalmer”, which I have always thought of as more of an experiment both in terms of writing and performance”. “VII / Född Förlorare” includes an array of guest appearances, and here follows a track by track description of the album. 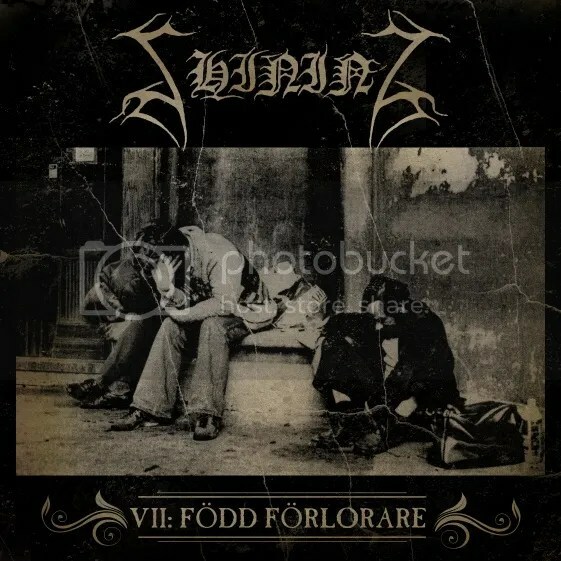 First song: “Förtvivlan, Min Arvedel” (Despair, My Heritage) marks the start of what promises to be the darkest album in SHINING’s career to date – and for a band that epitomises the exploration of darkness, the significance of that statement is self-evident. A video of the track is currently being made. Second song: “Tiden Läker Inga Sår” (Time Heals Nothing). As well as being tortured behind the microphone throughout most of the song, WATAIN’s Erik Danielsson makes an appearance on vocals on a track whose atmosphere is evocative of Led Zeppelin. Third song: “Människa O’Avskyvärda Människa” (Man Despicable Man) could perhaps be the most groovy, yet most sinister and dark song from SHINING. Chris Amott of ARCH ENEMY contributes a magnificent solo on the track. Fourth song: “Tillsammans Är Vi Allt” (Together We Are All) sheds an entirely new light on the band with its melancholic structure and the use of a grand piano as the lead instrument. The refrain is sung by Nordman, one of Sweden’s biggest pop stars. Fifth song: “I Nattens Timma” (In The Night Hour). As can be expected with a SHINING album, there is always one track that differs from the rest, and this is the one, with only piano, mellotron and a guest vocal appearance by Peter Bjärgö of ARCANA. Sixth song: “FFF” A track exploring family relationships, this is one of the most personal songs that Kvarforth has ever written. Below you can see SHINING performing the track “I och med insikt skall du förgå” from the IV album “The Eerie Cold”, live at Party.San 2009. © Party.San Open Air 2009.